Foriegn Affairs Secretary Alan Peter Cayetano burned down and silenced some foreign media for allegedly spreading biased news and information about the Philippines under the leadership of Pres. Rody Duterte. 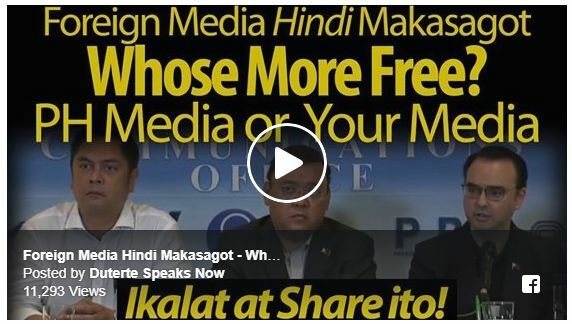 During a press briefing in Hong Kong, the former Senator narrated an incident when he asked "Western Media" practitioners on whose media is freer, their media or Philippine media? The Western Media practitioners couldn't answer his questions. The Yellows (Dilawans) or people closely related to the Liberal Party know our media is free but they have twisted the truth. Western Media allegedly connived with the Yellows to spread the lie. According to some political analysts who were defenders of Pres. Rody Duterte on social media, the Dilawans continued their lies because of the fact that the government of the foreign media can build public opinion against the Duterte admin. When the public opinion is against the government of Duterte or against us, the government of the foreign media can do whatever they want, an examples is what Western Media did to Iraq and Syria. According to Sec. Alan Peter Cayetano, he could give a quick example like the freedom of the press, he will not debate with the safety of the media is paramaount. He noted that when he asked some of his friends in the Western media that "what is more free, your media or our media." The foreign media couldn't answer. Sec. Cayetano made a follow up question by saying "Can you in your country say, that a politician or the President is a murderer, if you don't have any proof?" "Can you say that a politician is corrupt without giving any details, in the Philippines you can." The veteran lawmaker revealed also that in the Philippines it is indeed more free when compared to other countries like Singapore, you need to have proofs, in the US it's the same thing, as well as in Europe it's the same thing. But in the Philippines according to Sec. Cayetano, the realities whether in Faceboo or web pages, or on your newspapers you can practically say anything because we lean towards the leniancy, the freedom of expression more than the responsibility of these freedom. Sec. Cayetano also exposed that during the Aquino administration 77,000 people were murdered but there's no issue with the extra-judicial killings, unlike during the administrations of Pres. Duterte where EJK is now a major issue accusing the national government under the leadership of the first-ever President from Mindanao.